When a clinician writes a book about autism, it is based only on his practical experience with a client. When a parent/educator writes such a book, it is based on a lifetime of memories and real life experiences complete with the surprises and shocks as well as the joys and heartaches of each. Rarely does a reader get the chance to enter the home of a family that has a special child. In this book, the reader not only gets inside the household of the Squaresky family, but also participates in the journey from birth to adulthood of a child with autism who changed the family forever. Anecdotal stories abound, and they are uniquely poignant and entertaining. The author does not sugarcoat the truth. A Spot on the Wall is a blend of honesty, raw emotion and humor in a unique writing style that pulls you immediately into the family’s world. 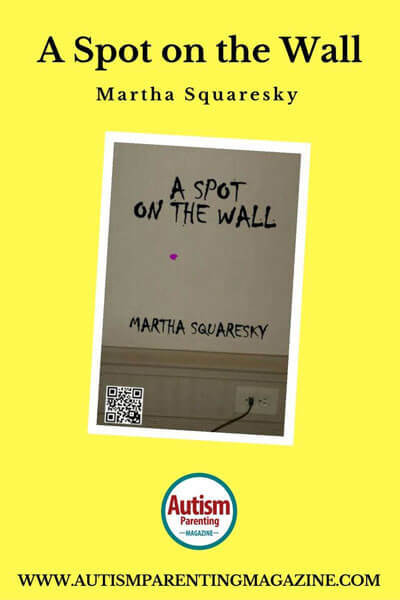 When award-winning author, Martha Squaresky, decided to write a novel, she compiled years of incredible stories about raising her autistic son, which she had shared with her 8th grade reading students and wrote a memoir. Her first writing in which she described inclusion and her family’s search for education and services that fit her son’s unique needs earned her the Outstanding Affiliate Article in 1998 for the ASCD (Association for Supervision and Curriculum Development). Her memoir described Greg’s fall from inclusion into a more restrictive environment and the family’s struggles to help Greg be happy and productive despite his limitations. Martha continues her saga in her blog, ourautismjourney.com, an entertaining and informative look at the family’s continued adventures with Greg. Martha recently retired from teaching after a thirty-four year career and looks forward to writing her second memoir.